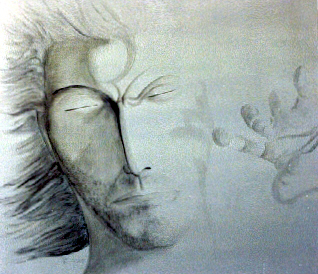 Smothered in anguish and clenched with despair, the soul struggles for power over our decisions. The opposing forces ruling over of our subconscious mind sometimes create a great deal of anguish in life. 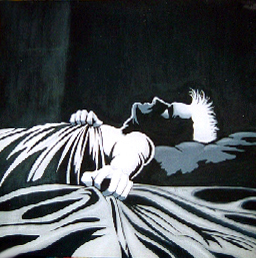 This painting was the first in a series of three Anguish paintings. This well-received series was reviewed by several art critics during the Black and White exhibit at the Installations One Gallery in Los Angeles. During the televised event in 1992, an offer was made by a Hollywood collector. 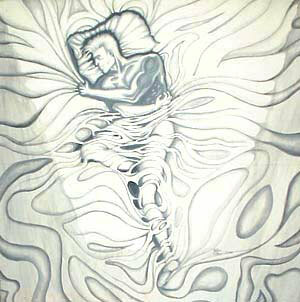 In 1993, Allan exhibited this painting during a show called "Inner space Outer space." The owner of the Balboa Building in Los Angeles saw the painting and commissioned him to do three new works. This painting was exhibited again at the NoHo Arts Festival in 1997, and an art aficionado saw this piece and wanted to buy it on the spot. The same thing occurred again during a warehouse party exhibit in 1999. In 2004 Linder finally sold the piece to a private collector to move on with his life.